Few months ago, I got Benefit Cosmetics They're Real! 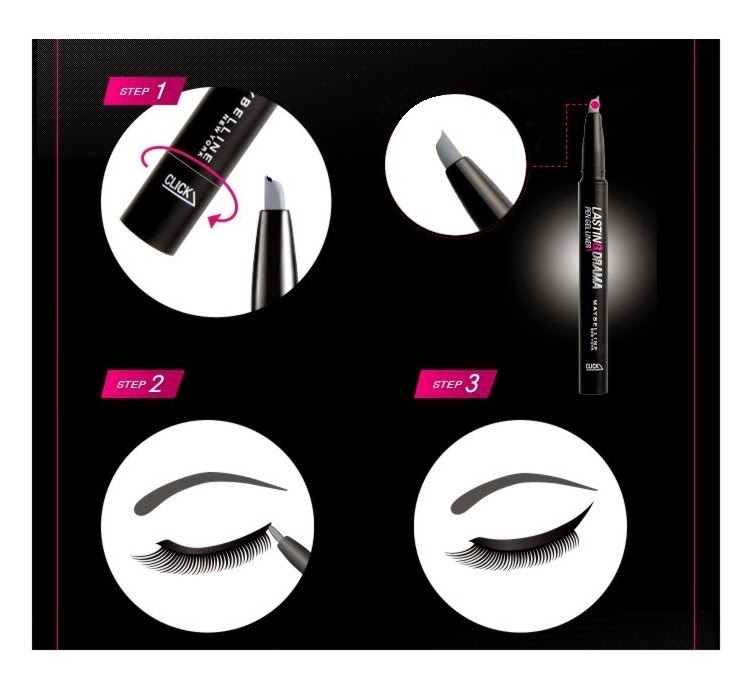 Push-Up Liner and even though I really liked the design of that liner, I just wasn't too impressed with the formula. 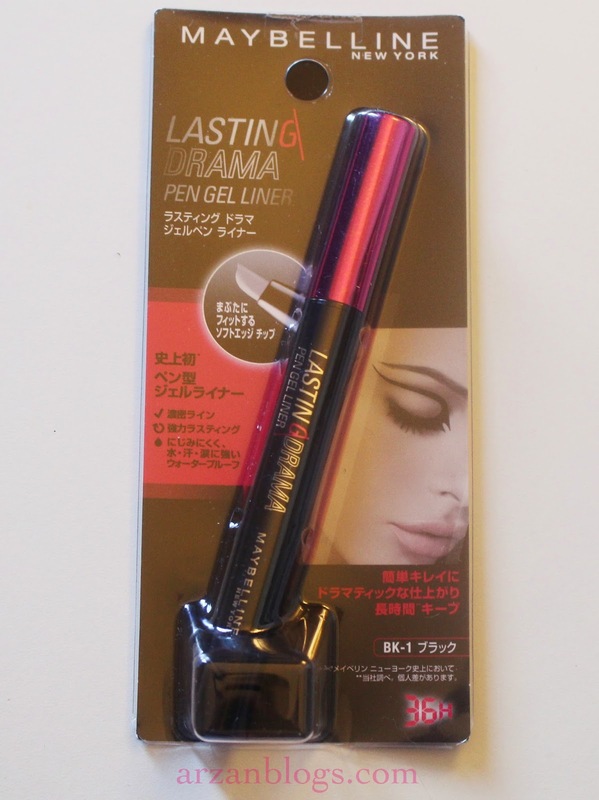 Around the same time, I actually found out that Maybelline (Singapore and Japan) had already launched a gel liner in a pen form: Maybelline Lasting Drama Gel Liner Pen. The concept was the same but I read reviews that the formula wasn't dry at all. I knew I had to try it but it was only available in Singapore. However, I recently found it on ebay (gotta love ebay) and ordered it from there. I was curious to see how it compares to Benefit Cosmetics They're Real! Push-Up Liner. This is currently available in Singapore and Japan but you can order it online. I got mine from ebay. This user ships from UK, so the currency is in pound sterling. I paid 7 GBP, which was about $13.12 CAD ($11.96 USD). I paid with my PayPal account. With the same seller, you pay a flat rate of 2.50 GBP for shipping, so the more items you get, the cheaper it will be. I wish I had seen that listing before because I would have gotten 2 liners. 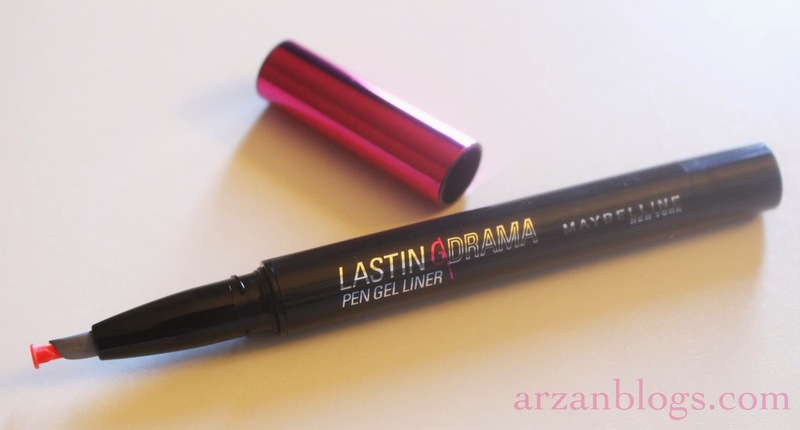 In United Kingdom, Maybelline has a very similar product: Maybelline Lasting Drama. It looks the same except for color difference. I'm not sure if it's the same formula but it seems like it is. They're both claimed to last 36 hours. It retails for £8.99. The angled silicon applicator is soft and flexible and it's supposed to give an easy application. It comes with a tip protector, so you simply remove it before using it. You can throw it out but it's suggested you keep it to prevent the gel from drying out. It has a twist-click mechanism, so product is dispensed each time you twist it. STEP 1: Twist base towards right once or until gel appears. Gel should appear after you twist once or twice. However when you first get it, you have to click it 8-10 times. I twisted more than that before I actually noticed the product coming out. I usually like to start off from the middle and then work my way from there. 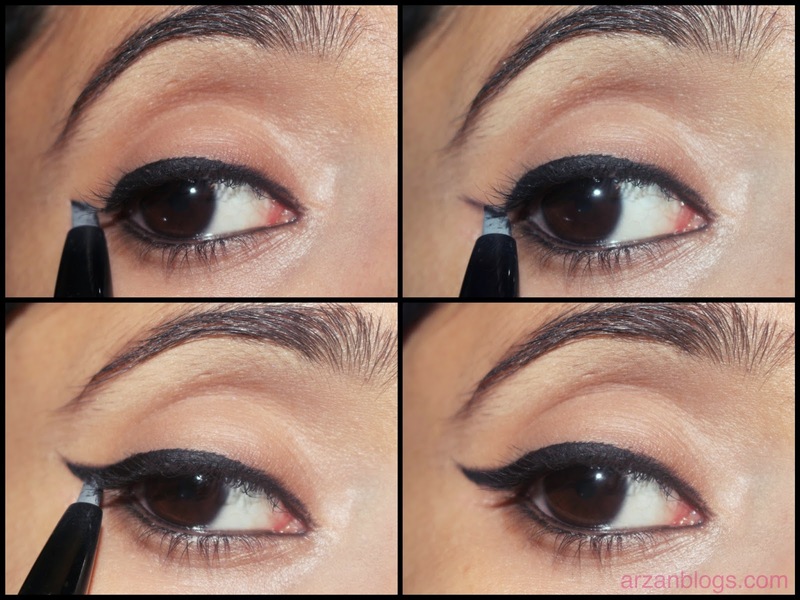 Simply angle the tip on your outer corner and use it to create the wing. After that, just fill in the rest. 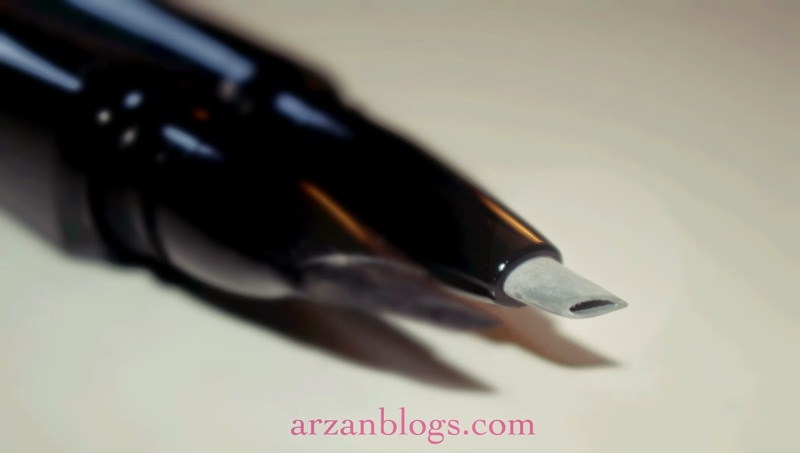 Convenient: I love how you get the gel liner in a pen, so it eliminates the need to use a brush. 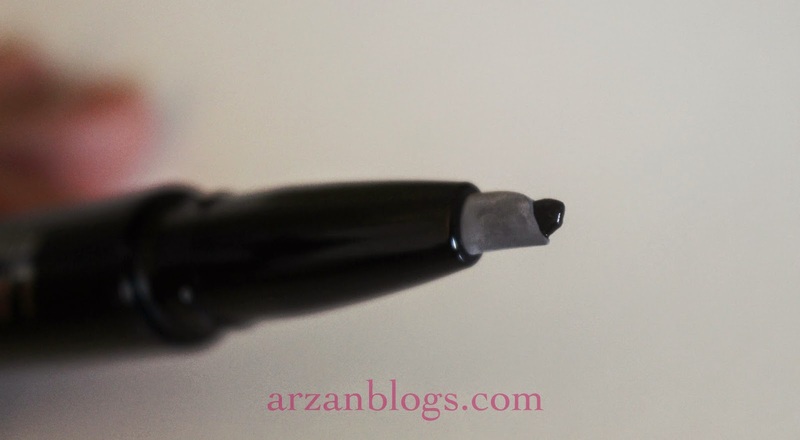 Also, when you twist, you get a reasonable amount of liner to work with (don't click too much). Long wearing: I had it on for more than 8 hours and it still looked pretty good. It doesn't smudge. Waterproof: It's waterproof, so you can wear this to the pool/beach. However, you might have to use waterproof eye makeup remover or oil to remove it. Matte Black: I love the fact that it's matte black. It's great to create a bold eye look. Not that easy to apply: The tip makes it harder to work with if you fine lines like me. Also, I feel like it's harder to achieve a clean look but I do use a waterproof makeup remover and a Q-tip to clean up. 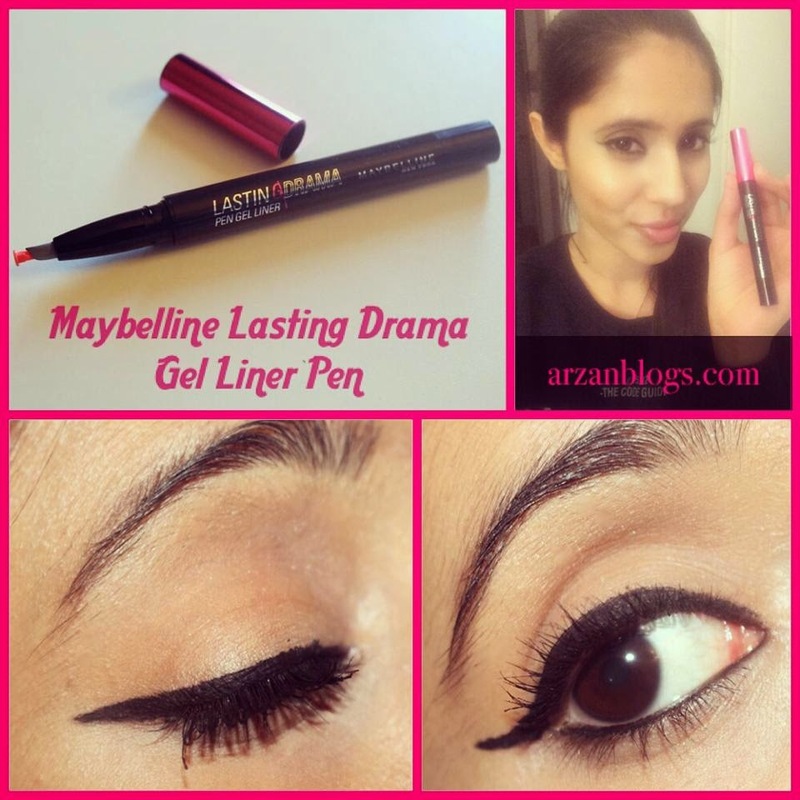 Maybelline Lasting Drama Gel Liner Pen is certainly the dupe for Benefit Cosmetics They're Real! Push-Up Liner. The idea is the same but there are slight differences. Flexible/Angled tips: Both of the tips are angled and very flexible. 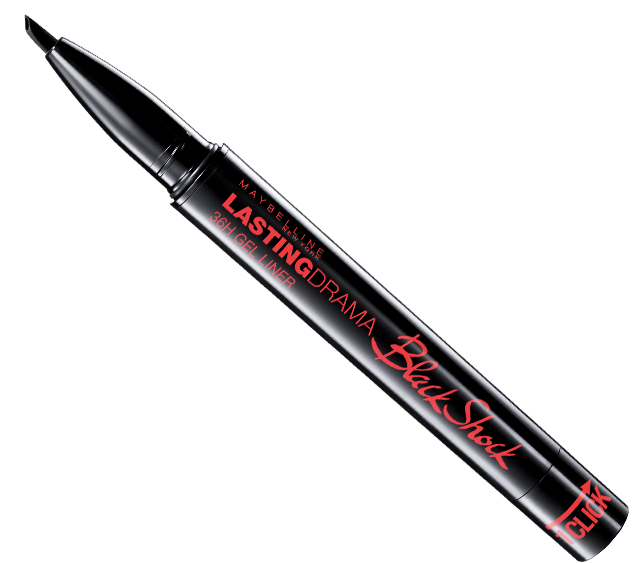 Long wearing: Both of these liners last all day. They don't smudge at all. Waterproof: I tried washing it off with water and neither of them came off. 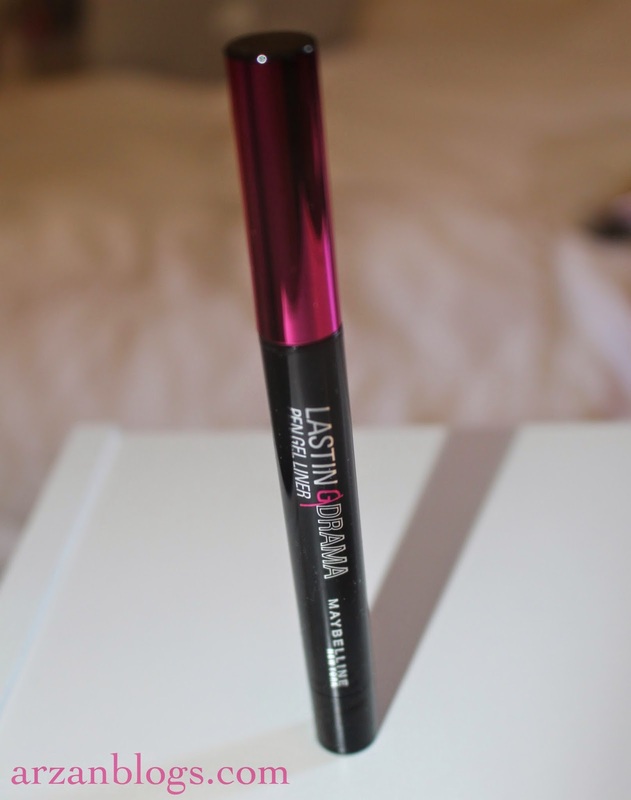 Maybelline liner is much more slim and takes less space, while Benefit liner is more bulky. 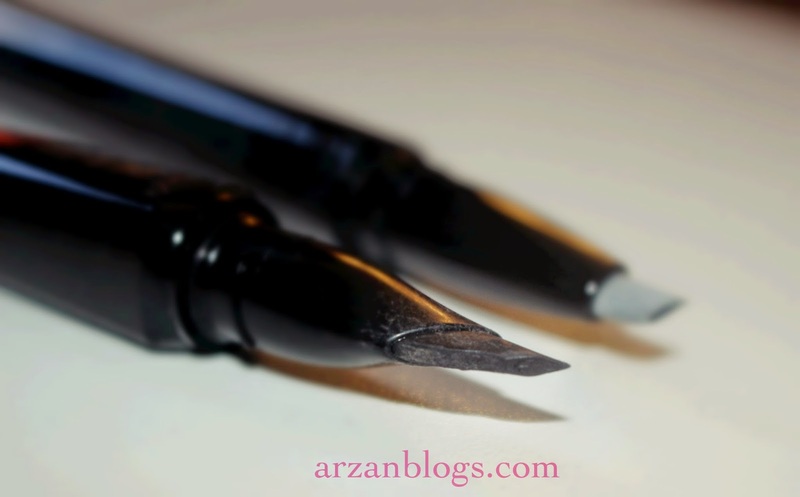 I find that the tip of Benefit liner is much better to work with than the Maybelline one. 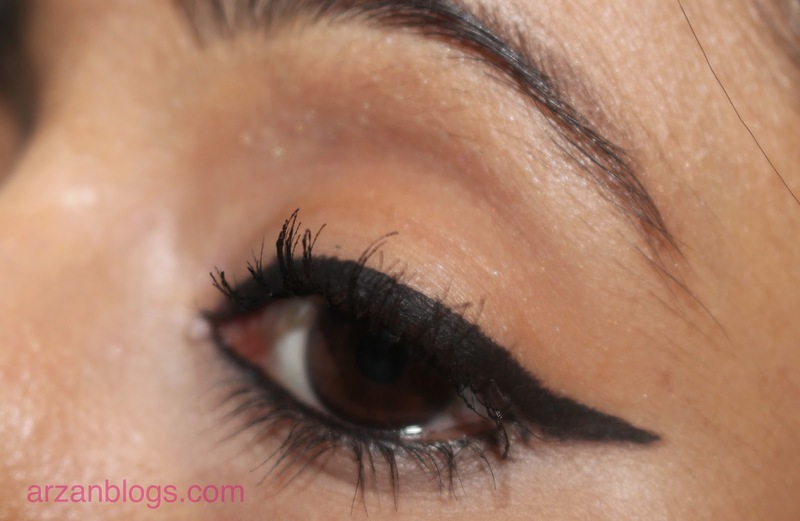 Maybelline liner doesn't dry as quickly as Benefit liner, so I don't have to rush to get the winged line with it. 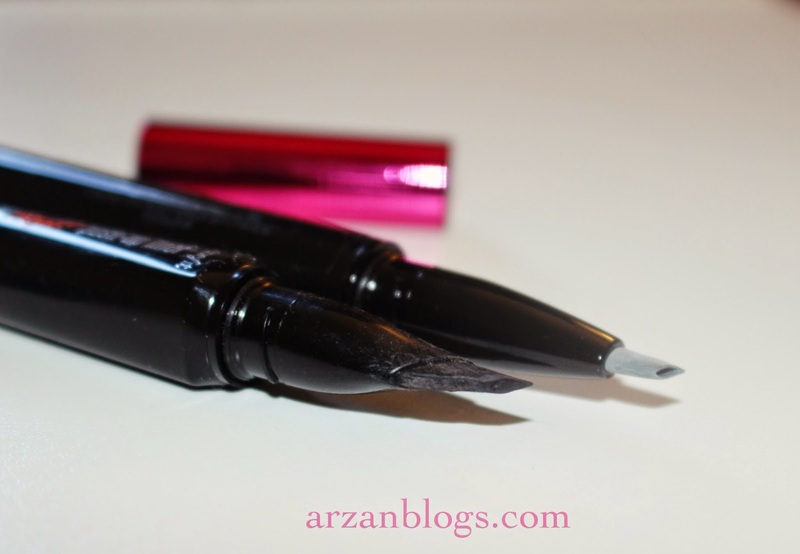 Maybelline liner goes on much more smoothly than the Benefit liner. It doesn't clump nor flake as much either. 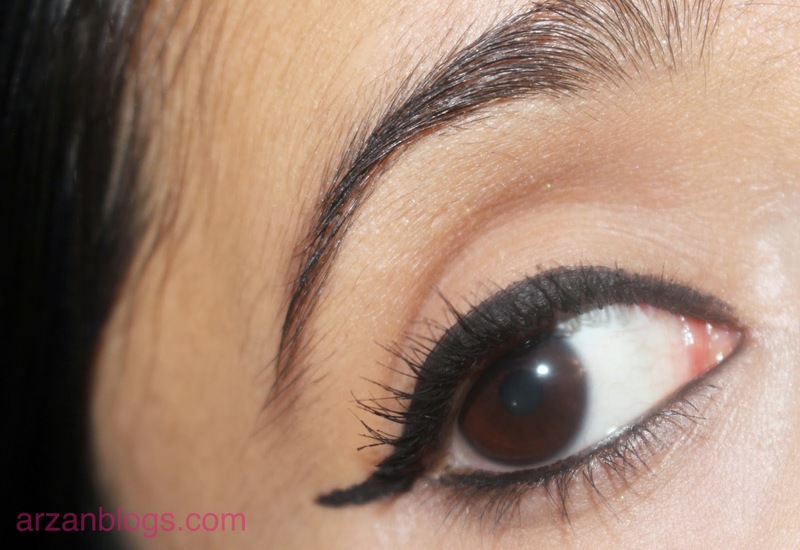 Maybelline liner's formula is way better! It doesn't dry as quickly as Benefit liner, so I get more time to work with it. However, I do prefer the tip of Benefit liner. It's much easier to work with and I noticed I took less time to achieve the winged line compared to the Maybelline liner. 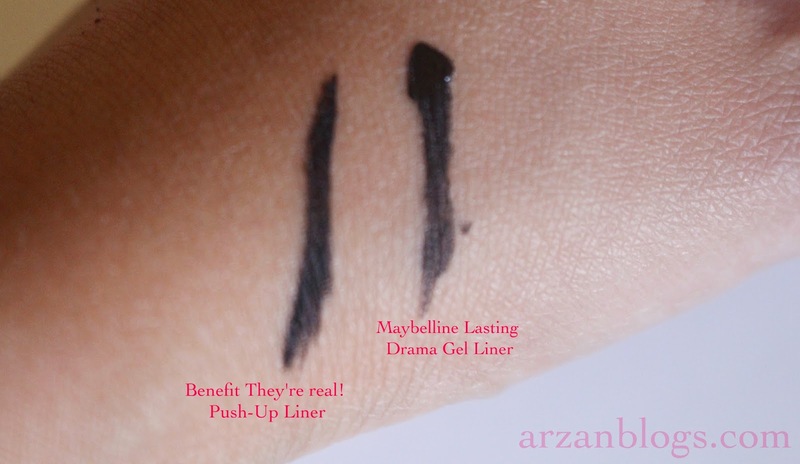 Nonetheless, I find that the Maybelline liner is better option. 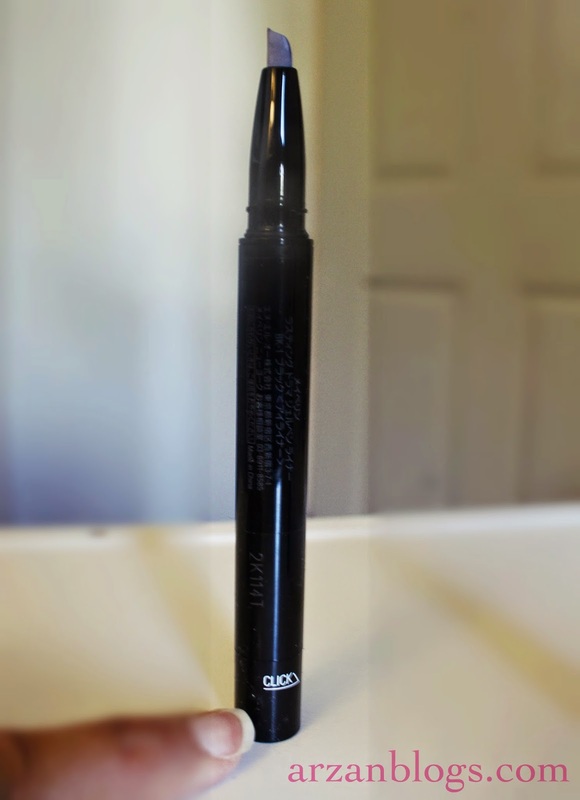 It has a much better formula and even though the tip isn't that great, it doesn't bother me because it costs less than half price of Benefit Cosmetics They're Real! Push-Up Liner. I'm quite impressed with this liner! I really like the formula and I do like using this for drawing thick lines. I'm not in love with the applicator but it doesn't bother me to the point that I would hate it. Do I prefer this over gel liner? Depends on the days. If I'm too lazy to take out the brush and gel liner, then I will most likely lean towards this. However, this will definitely not let me achieve a clean thin line. In that case, I'd most likely end up using a gel liner or liquid liner. 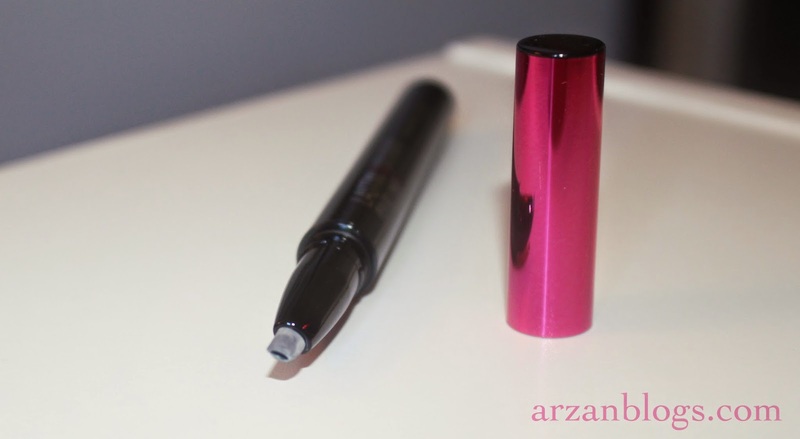 Just like the Benefit liner, this one does take some time getting used to the tip. Keep in mind that this is mainly used to create bold lines. Also, it comes off fairly easily with waterproof makeup remover! 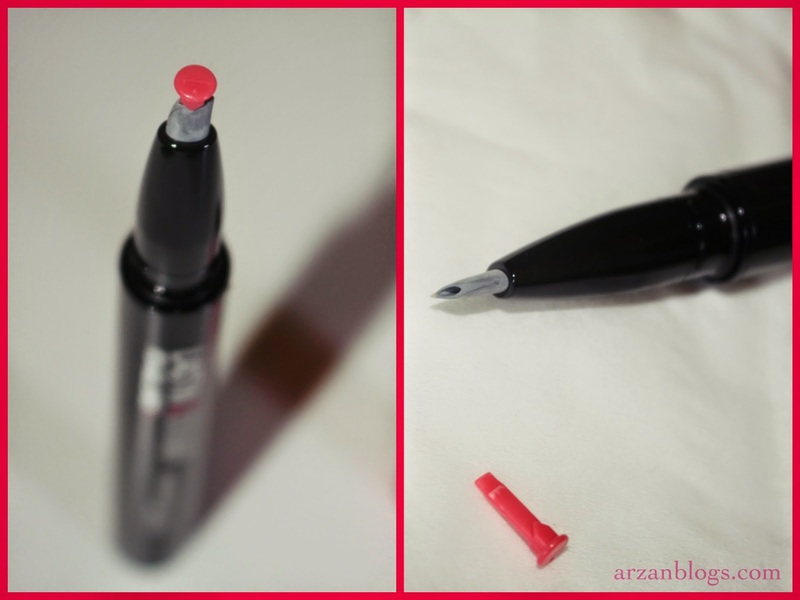 It's definitely a much cheaper alternative than the Benefit liner!